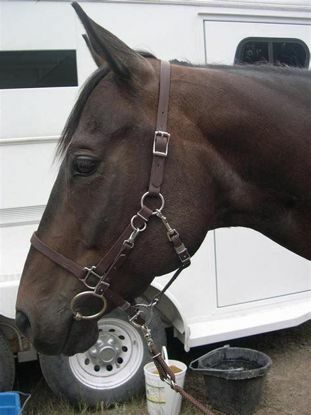 John Lyons` Perfect Horse -- "This is a well constructed Halter Bridle with a versatile design." Moss Rock is the proud provider of tack for the Mobile AL Mounted Police Unit! Distance and trail riders, and their horses, have special needs. These products are designed to be easy to put on, lighter, and more comfortable to the horse. There are several more products designed specifically for distance riders under the Bitless Headstall product category. The Halter Bridle is very popular because the halter never has to be removed during a ride; Just detach the bit hangers and drop the bit! 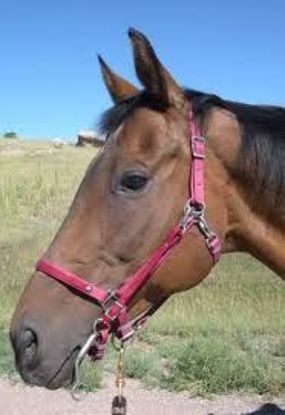 This `Lite` version omits those pesky halter squares on the nose band that can cause rubs on some horses. The brow band moves up and down on the poll and crown straps, making this bridle a perfect fit for a wide range of horses. Please scroll down for additional info! 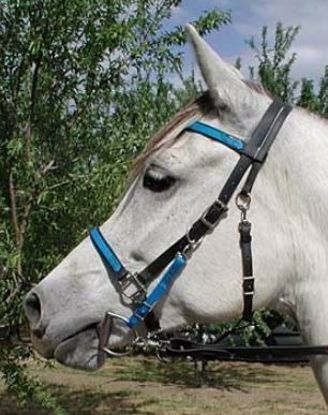 The Halter-Bridle is very popular because the halter never has to be removed during a ride. This version combines two of our existing products -- The Halter and the Bridle Converter, and is for those who do not like bit hangers, or just want another option! Just slip in the bit (which you will already have attached to the Converter) and snap the Converter browband around the Halter pollstrap. Shown here by Akiah in Colorado in saddle brown with hunter green overlay. Scroll down for further info and options! This halter bridle does not include a brow band, which is wonderful for those equines who have ear issues or are head-shy. Poll strap adjustability is achieved on both sides of the head, with bridle balance being achieved with a jowl strap. A set of bit hangers is included for quick and easy attachment of your bit . See below for more info! 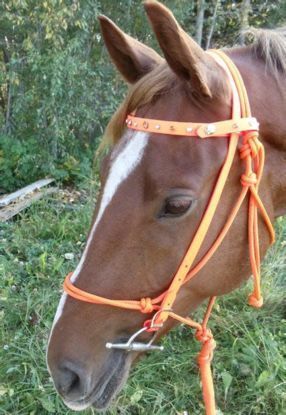 The Halter-Bridle is popular with endurance and trail riders because the halter never has to be removed during a ride. The bit can be quickly added at any time with the adjustable bit hangers. The brow band moves up and down on the poll and crown straps, making this bridle a perfect fit for a wide range of horses. 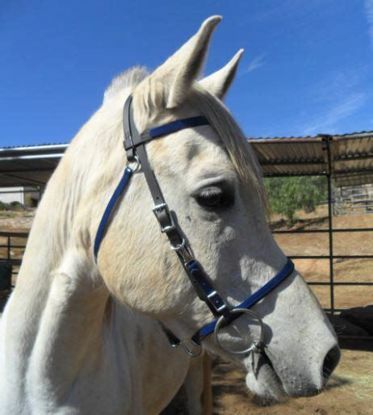 Our Halter-Bridles are lighter and more flexible than many others available. Please scroll down for additional info! The Bridle Converter is probably the most convenient piece of tack you`ll ever own. It snaps over/around any halter and you`re ready to ride in seconds. Shown here by handsome Warrior in Alberta, Canada, in hunter orange beta with amber and clear crystals. If you ride several horses with different bits, the Bridle Converter can also be ordered with quick snaps so you can quickly change bits and be off riding the next horse. Trainers will love this! Scroll down for further information!